I hope you know that you are deserving of all the good things in life. You deserve the quiet confidence that makes you believe that anything is possible. You deserve the tranquility of morning sunrises that remind you of beauty in a world that can seem bleak at times. You deserve someone that will wrap you up in their arms and hold on tight without an ounce of selfishness to it. You also deserve to be that person for yourself. 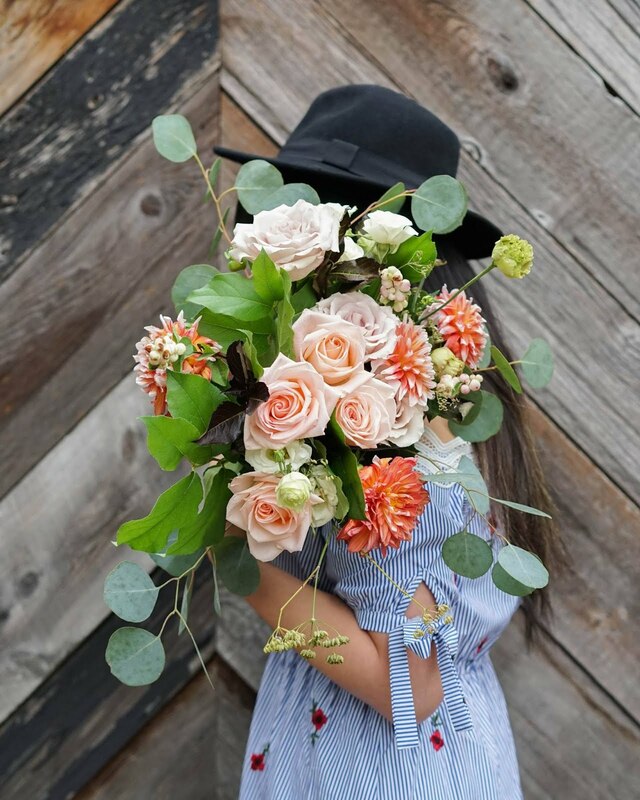 You deserve someone who when you try to find words to describe makes you realize that words simplify feelings, and that forever just is not enough. You deserve a love that even time will lie down and be still for. You deserve moments of pure unadulterated happiness that makes you short of breath. You deserve to experience creativity that cannot be tamed and should not be tamed. You deserve everything good and so much more and I hope 2018 is the year for you. It is the last cake of the year! 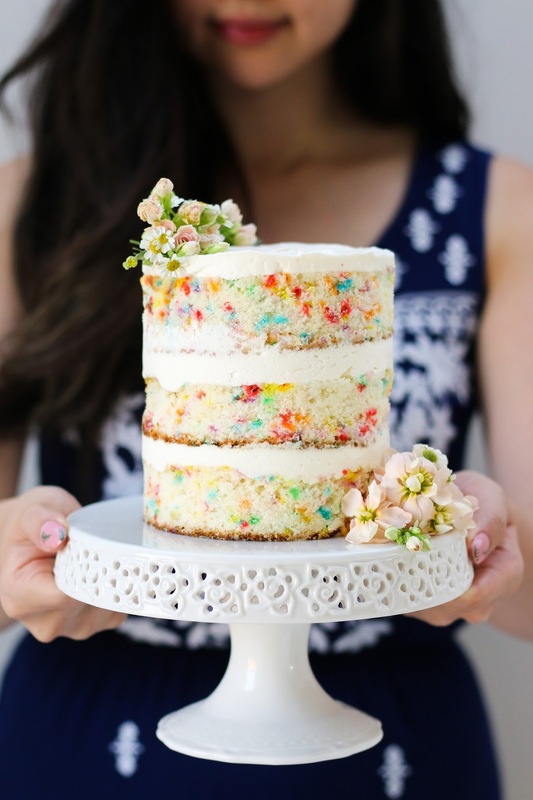 It is a simple cake but rainbow sprinkles make any cake a worthy celebration cake. Last year was a year of pies but I think this year it was cake that took precedence. I am definitely not complaining. 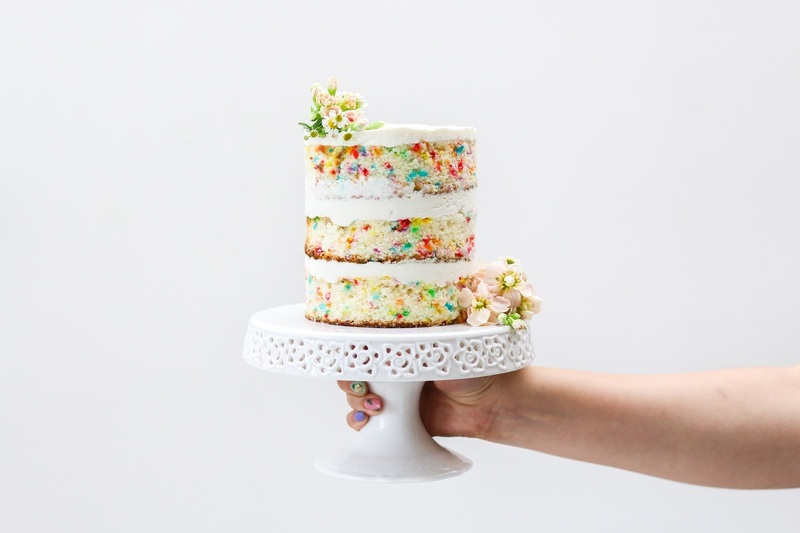 I have made many new favourite cakes this year and this funfetti cake from My Name is Yeh is without a doubt a top contender. I purchased my copy of Molly on the Range when it came out and subsequently saw many bloggers make Molly's signature cake. 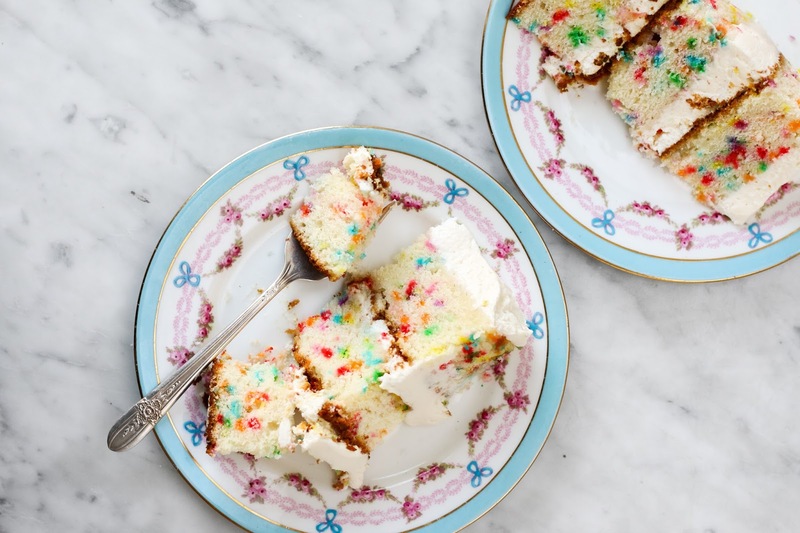 I do not know why it took me this long to finally make this rainbow speckled cake. I wish I made it sooner because it is so good. It has that vanilla flavour (from the clear imitation vanilla) that is synonymous with childhood white cake nostalgia. It is everything. 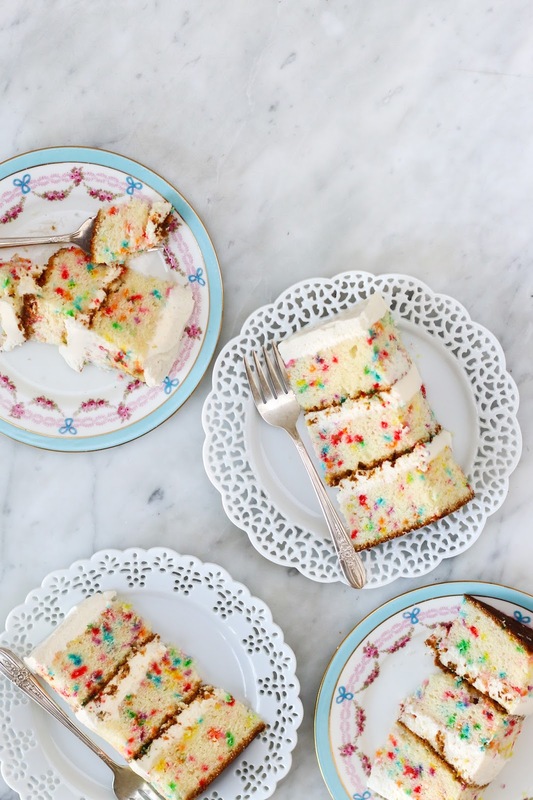 I paired it with my favourite simple whipped cream cheese frosting because childhood me (and present day me) loved everything with a cream cheese frosting. 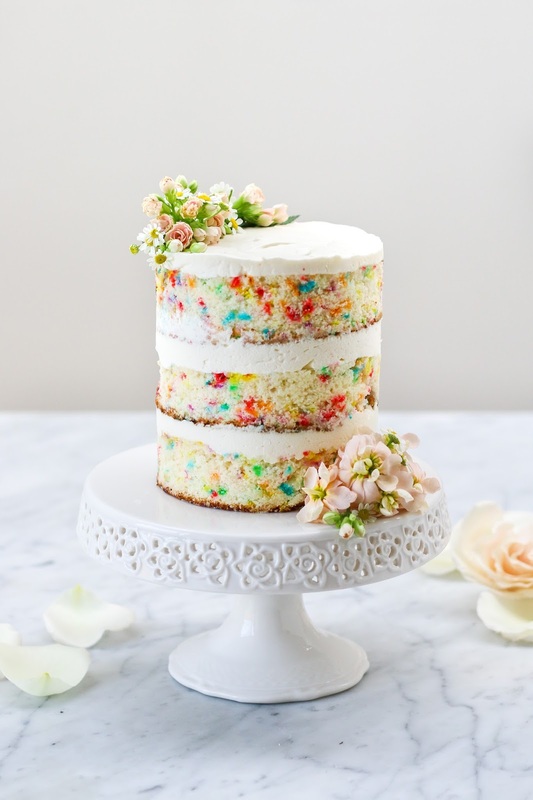 I went for the completely naked cake look by taking off the sides of the cake to really showcase the rainbow speckled crumb inside. This cake is perfect for any celebration and it is going to by my New Year's cake this year —maybe it will be yours too! Preheat oven to 350° F. Preapre three 6-inch cake pans. With an electric mixer or in the bowl of a stand mixer, cream together the butter and sugar until fluffy. Add the egg whites, one at a time, mixing well after each one. Mix in the vanilla and oil. With your mixer running on low, add this to the butter mixture in three additions, alternating with the milk. Once you have a smooth batter, fold in the sprinkles. Do not overmix! Divide the batter evenly between the pans. Bake the cakes until a toothpick inserted into the center comes out clean. Begin checking for doneness at around 25 minutes. Let the cakes cool for a few minutes in the pans and then flip them onto a cooling rack to cool completely before layering. With a paddle attachment on your mixer, beat cream cheese until light and fluffy. Gradually add in icing sugar and beat for 2 - 3 minutes until smooth. In the same bowl, gently fold in the whipped cream. 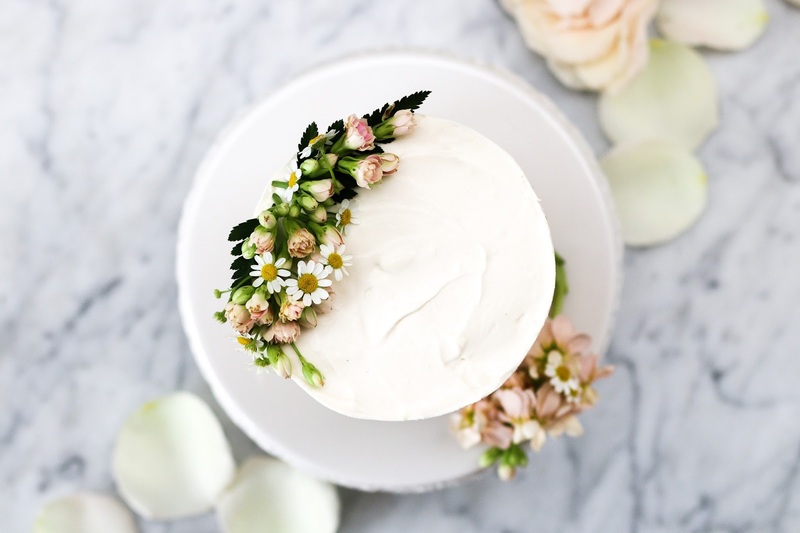 To achieve the entirely naked look (like in pictures above), I used a cake ring that was slightly smaller than the diameter of the cake to cut out the cake layers. I used a 5 inch cake ring and cut through the centre of each cake layer. 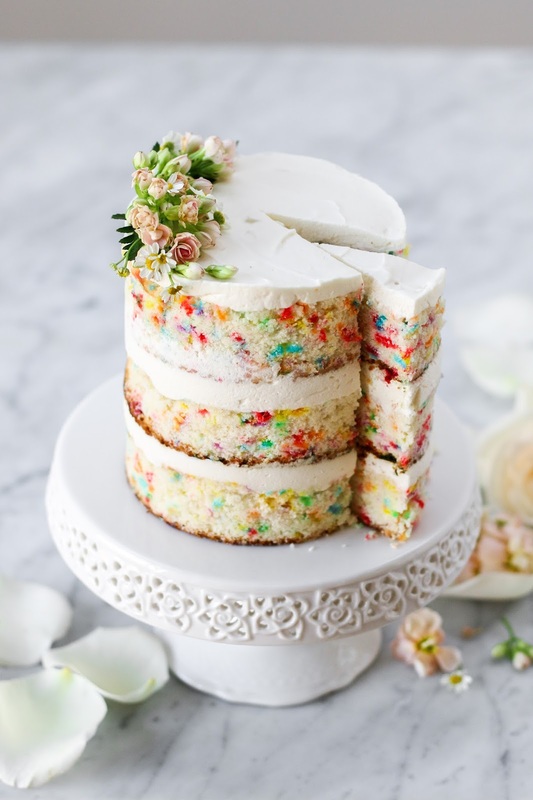 This technique will removed the golden/brown cake on the outside to reveal the rainbow speckled cake layers. 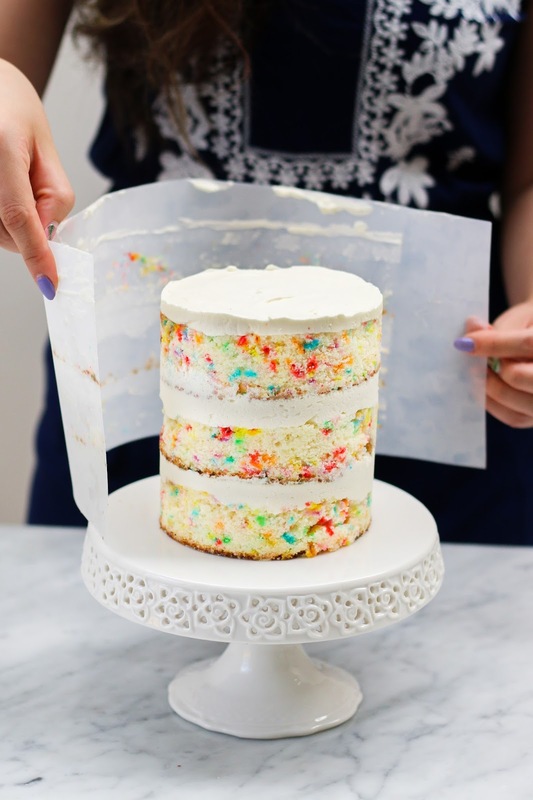 Once I put the first layer of the cake down, I take a tall piece of acetate and wrap it around the circumference of the cake and secure it with tape. I place the 5-inch cake ring around the acetate to make sure it is extra secure. 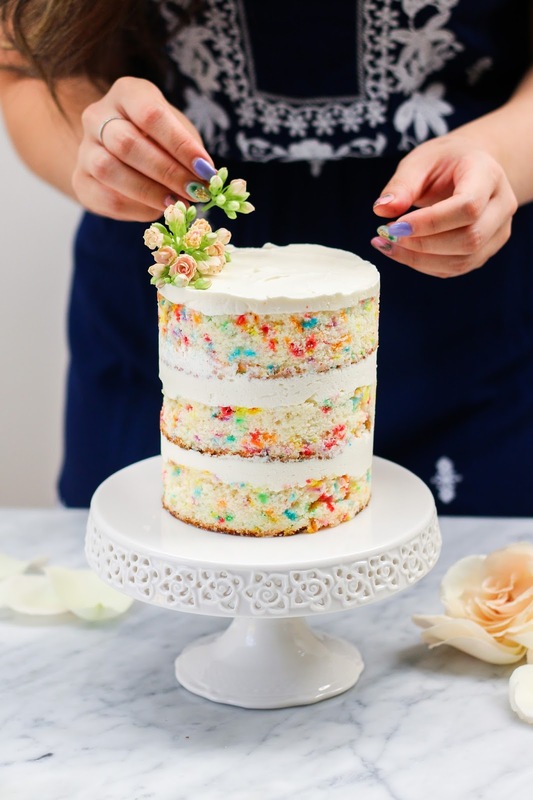 A generous scoop of frosting goes on top of the cake layer before sliding in the second layer of cake into the acetate tube. 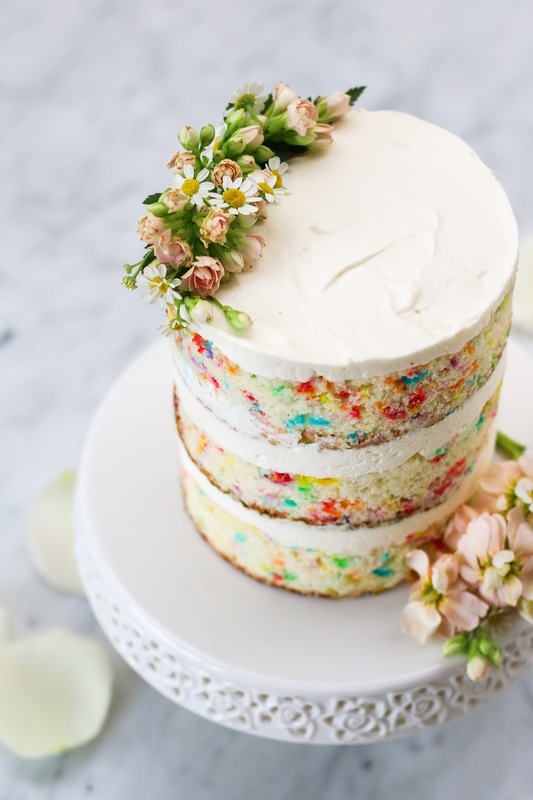 Alternate between cake and frosting until you reach the top, ending with a layer of frosting. Wrap the cake securely and chill the cake in the freezer for a minimum of 8 - 10 hours, until the cake has set. At least 3 hours before serving, remove the cake from the freezer and using your fingers and thumbs, pop the cake out of the cake ring. Gently peel off the acetate and transfer cake to platter or stand. It is important to peel the acetate off when the cake is still frozen to ensure clean sides. Let it defrost in the fridge or counter for a minimum of 3 hours. Happy baking + happy new year!